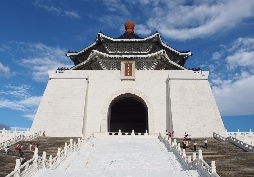 The National Chiang Kai-shek Memorial Hall (traditional Chinese: 中正紀念堂; simplified Chinese: 中正纪念堂) is a Taiwanese national monument, landmark and tourist attraction erected in memory of Chiang Kai-shek, former President of the Republic of China. 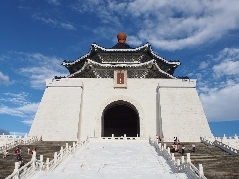 It is located in Zhongzheng District, Taipei, Taiwan. Taipei 101 and formerly known as the Taipei World Financial Center – is a landmark supertall skyscraper in Xinyi District, Taipei, taiwan. The building was officially classified as the world's tallest in 2004, and remained such until the completion of Burj Khalifa in Dubai in 2009. In 2011, the building was awarded the LEED platinum certification, the highest award according to the Leadership in Energy and Environmental Design (LEED) rating system, and became the tallest and largest green building in the world. Taipei 101 is primarily owned by pan-government share holders. The name originally planned for the building, Taipei World Financial Center, until 2003, was derived from the name of the owner. The original name in Chinese was literally Taipei International Financial Center . The Taipei Astronomical Museum is a museum in Shilin District, Taipei, Taiwan. The museum took over the responsibilities of the Taipei City Observatory.The dome at the museum consists of geometrically identical pieces.